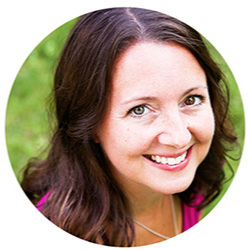 This is Week #19 of my 2011 cooking challenge! Click here to view all recipes from this challenge. All recipes created for this challenge come from the Food and Wine Annual Cookbook 2010: An Entire Year of Recipes. Ok, so I haven't had the best week in the world. Everything seems to have exploded at once. Why does that always seem to happen? By Saturday of this past week, I just wanted comfort, and preferably in the form of food. 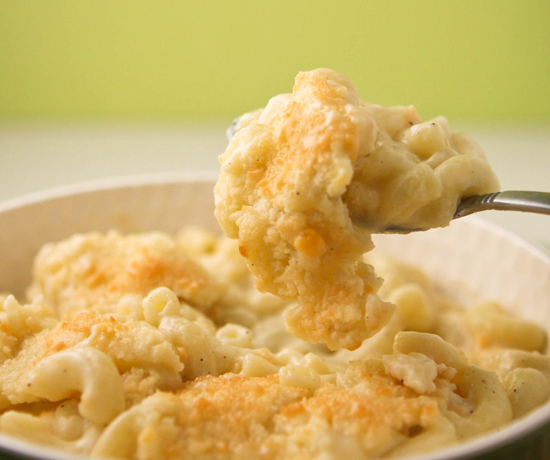 I was pleased to see that this comforting macaroni & cheese recipe was next on the list for my challenge! That could not have worked out more perfectly. I prepared it while my boys napped and then served it to them for dinner (they both loved it!) and, after they were in bed for the night, I went downstairs and scooped myself a huge bowl full of the comforting cheesiness. I sat in my little spot on the couch as I devoured its splendor and sipped wine and flipped through cookbooks. I suddenly forgot about the insanity in my world for a bit, and just enjoyed my comforting down-time. Preheat your broiler. In a medium saucepan of boiling salted water, cook 2 cups of elbow macaroni until al dente. Drain well. 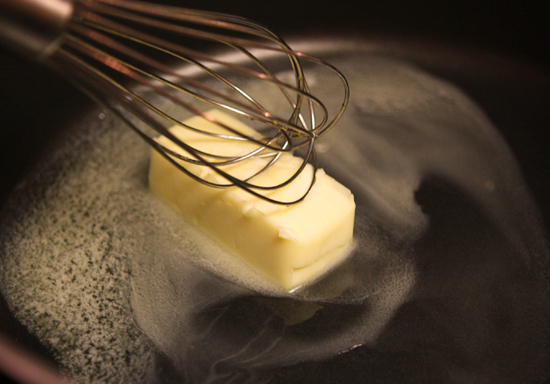 Meanwhile, in another medium saucepan, melt 4 tablespoons of butter over low heat. 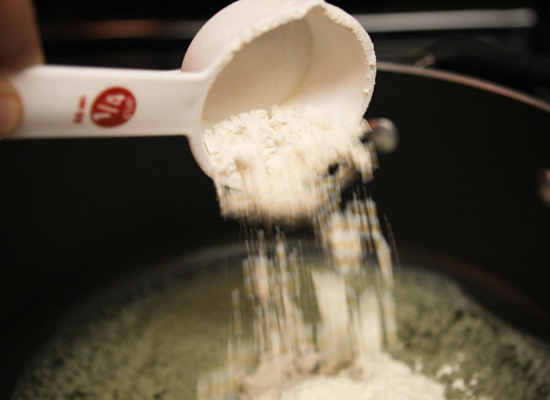 Whisk in 1/4 cup of all-purpose flour until a paste forms. Gradually whisk in 3 cups of milk until smooth. Bring the sauce to a boil over moderately high heat, whisking, until thickenend. 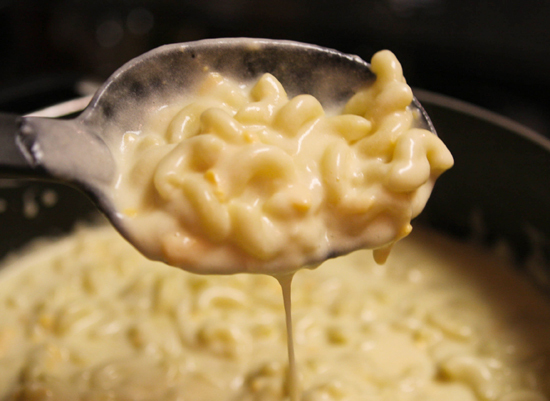 Stir themacaroni into the the cheese sauce and transfer to a 9x13 glass or ceramic baking dish. Sprinkle 2/3 cup freshly grated Parmigiano-Reggiano cheese over the top. And broil 4 inches from the heat source for 4 minutes, or until richly browned. Let rest for 5 minutes before serving. Thanks for being there when I needed you, mac & cheese. Preheat the broiler. In a medium saucepan of boiling salted water, cook the macaroni until al dente; drain well. Meanwhile, in another medium saucepan, melt the butter over low heat. Whisk in the flour until a paste forms. Gradually whisk in the milk until smooth. Bring the sauce to a boil over moderately high heat, whisking, until thickened. Off the heat, stir in the mixed shredded cheeses until melted. Season with salt and pepper. Stir the macaroni into the cheese sauce; transfer to a 9x13-inch glass or ceramic baking dish; sprinkle on the Parmigiano-Reggiano. Broil 4 inches from the heat for 4 minutes, until richly browned. Let rest for 5 minutes before serving.